Sailors and Marines aboard the San Diego-based amphibious assault ship USS Makin Island conducted night vision flight operations last week during training in the South China Sea. 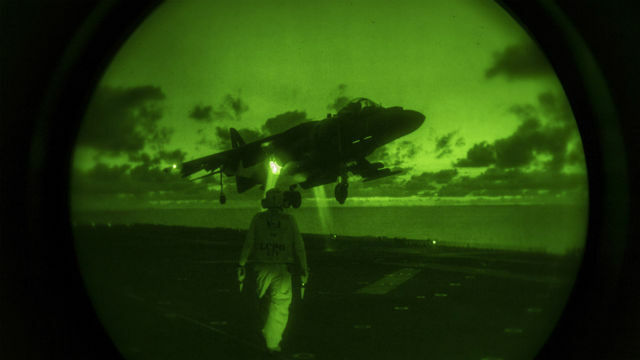 Using night vision devices, pilots and aircrew conducted takeoffs and recoveries of Navy MH-60S Sea Hawk helicopters and Marine Corps MV-22B Osprey tiltrotors, AV-8B Harrier fighter jets and CH-53E Super Stallion helicopters. “Maintaining our night vision device qualifications ensures our pilots can leverage all the advantages of flying at night,” said Maj. Jay Hanson of Marine Medium Tiltrotor Squadron 163. Hanson said the night often presents more favorable conditions for pilots, including decreased air traffic, calmer air, and less radio activity. Makin Island is the flagship of an amphibious ready group that is conducting maritime security operations in the vast 7th Fleet area, which stretches from the international dateline to the eastern coast of Africa, and from the Antarctic to the Kuril Islands northeast of Japan.